The miniweight boxing title of the animal world belongs to the mantis shrimp, a cigar-sized crustacean whose front claws can deliver an explosive 60-mile-per-hour blow akin to a bullet leaving the barrel of a gun. Now, a Duke University study of 80 million years of mantis shrimp evolution reveals a key feature of how these fast weapons evolved their dizzying array of shapes—from spiny and barbed spears to hatchets and hammers—while still managing to pack their characteristic punch. Duke researchers Philip Anderson and Sheila Patek studied nearly 200 mantis shrimp specimens representing three dozen species. Mantis shrimp use a system of biological springs, latches and levers to power their fast strikes, enabling them to strike much more swiftly than would be possible with muscle power alone. The team took careful measurements and calculated each specimen's ability to transmit muscular force and motion to the part of the claw that swings out to smash or spear their prey—a mechanical property known as kinematic transmission. 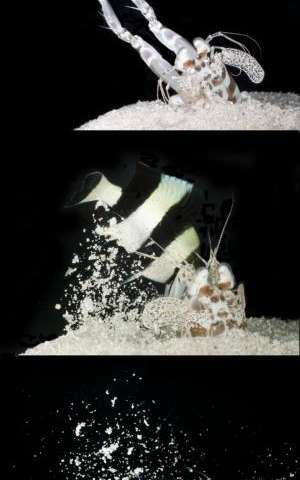 When the researchers mapped their measurements onto the mantis shrimp family tree, they discovered that certain parts of the claw were more strongly associated with changes in strike mechanics than others—enabling the other parts to evolve relatively independently without compromising the mantis shrimp's award-winning wallop. "This research sheds new light on how these amazing movements evolved," Anderson said. 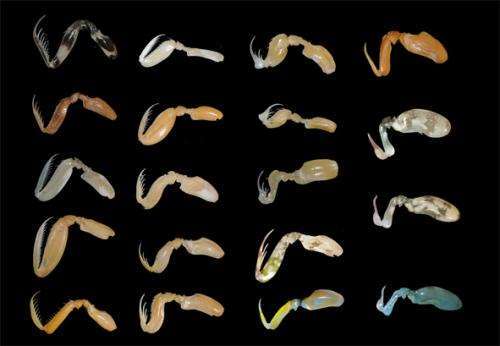 It suggests that mantis shrimp claws were able to evolve so many shapes because their mechanical properties are more affected by changes in some parts than others—a pattern the researchers call "mechanical sensitivity." Mantis shrimp claws come in a dizzying array of shapes -- from spiny and barbed spears to hatchets and hammers. Rather than evolving in a coordinated way, a new study finds that each part of the mantis shrimp's complex claws followed its own evolutionary path. Credit: Thomas Claverie, Universite de Montpellier.